In a conversation with George Demmy, CTO of TerraGo, GISCafe Voice learned about the release of OpenGeoPDF technology, now available with TerraGo Publisher for ArcGIS, TerraGo Composer and TerraGo Toolbar. Cities worldwide are charged with the same challenge: that of creating or retrofitting sustainable, intelligent infrastructure. Cities need the best in design, geospatial, visualization and analytical tools to realize a viable and intelligent city design. 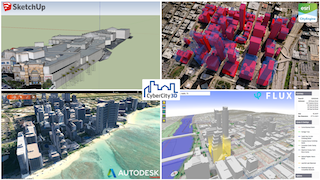 3D City design is architectural design times thousands, plus it must have the ability to be interwoven with other surrounding infrastructure and foster an urban conversation. “All predictions are wrong, some are useful. Predictions of geospatial technology trends have been the topic of recent discussions by the OGC Board of Directors and the OGC Planning Committee. One of my roles as OGC Chief Engineer is to offer a slate of “ripe issues” as a basis of these discussions. This blog provides an overview of the ripe issues developed in March 2013 and explains how they were developed. Future blogs will discuss each issue individually. These issues were developed by reviewing over 200 recent articles from information technology journals from IEEE, ACM, etc. as well as from geospatial industry magazines and other publications. Geospatial World’s recent “Thought Leaders Edition” was particularly useful in identifying issues from a geospatial industry perspective. “25 February 2013 – The Open Geospatial Consortium (OGC®) has adopted “Semantic annotations in OGC standards” as an OGC Best Practice. 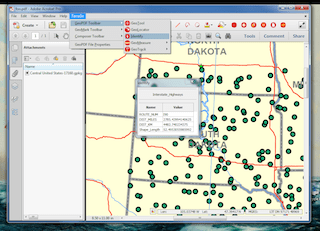 OGC standards provide standard ways of locating and transporting network-resident geospatial data and ways of locating and invoking geospatial services. Without proper descriptions of these resources, however, use of the resources is limited to small user groups. To make a geospatial resource more widely discoverable, assessable and useful, resource providers must annotate the resource with descriptive metadata that can be read and understood by a broad audience. Without such metadata, people will neither be able to find the resource using search engines nor will they be able to evaluate if the discovered resource satisfies their current information need. The Open Geospatial Consortium (OGC) calls for participation in a major interoperability testbed, OWS-9. OWS-9 builds on the outcomes of prior OGC initiatives. A bidders’ teleconference will be held on March 9, 2012. More information at the URL below. The Point of Contact is Nadine Alameh: techdesk@opengeospatial.org. The Open Geospatial Consortium (OGC®) membership has voted to adopt the candidate OGC Open GeoSMS Standard as an official OGC standard. What the OGC Open GeoSMS Standard provides developers with is an extended Short Message Service (SMS) encoding and interface to facilitate communication of location content between different LBS (Location-Based Service) devices or applications. SMS is an open text communication service most commonly used in phone, web and mobile communication systems for the exchange of short text messages between fixed line or mobile phone devices. According to the press release issued today, the lightweight and easy to implement Open GeoSMS Standard facilitates interoperability between mobile applications and the rapidly expanding world of geospatial applications and services that implement OGC standard interfaces, encodings and best practices.